Publix Ad offers special prices for quality food this week. Spend your Easter holiday having the best foods from one of the elegant supermarkets. Pair your drink with the correct food. Explore the beginning of the range of products of Publix Weekly Ad. The store will not be operating on Easter Sunday. Stocking up your favorite foods might be better and easier for you. Use the Publix Ad to save on everything. Over $759 saving is viewable on this ad. You can find delicious side dishes. Recipes are available on pg 2-3. A more detailed version of these, and more recipes are on the official page of the Publix. Easter candies and treats are an important part of this sale. 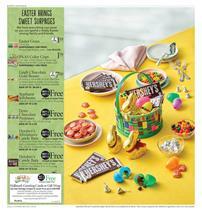 Check out Starburst jellybeans, Dove chocolate promises, Hershey's Miniatures candy bars, and more on pg 4. Deli foods like turkey slider trio, a dessert platter, Small Captain's choice shrimp platter, and more are available on pg 5. Seafood is one of the most popular choices of people in Easter month. Buy small lobster tails for only $5.99! A fine selection of meat is perhaps what you need for a celebration. Standing rib roast is only $6.99/lb. this week. Publix Premium Semi-Boneless Half Ham $1.29/lb. 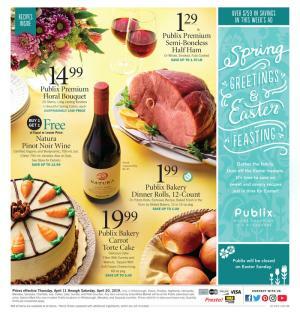 Publix Easter deals on fresh products are multiple-buy savings or BOGOs. A lot of them are on sale. Buy Publix peeled and cored pineapple for only $2.99 this week. 2 BOGO Free deals are available on pg 8. Save $2.50 on 2 Harvest Snaps snack crisps. Publix deli-bakery range offers are also great this week. These can make great Easter treats. Buy Publix bakery mini holiday specialty cake, decorated chocolate chip cookie, Publix bakery egg bread, and more in this part of the supermarket. Weekly BOGO Free sale of Publix Ad is available on pg 12-16. This week they have a more extensive range with BOGOs. You can always check this page, follow our Facebook page, subscribe to get emails about the deals. General Mills, Mott's Juice, Mueller's pasta, and dozens of more products are available in the BOGO Free range. Grocery and snacks are two major categories of the BOGO sale. Not only BOGOs are in this part of the Publix Ad. Gatorade thirst quencher will be 10 for $10 sale! You can also find organic snacks and fresh foods. Dunkin' Donuts coffee is on sale its only $6.49! Shop canned foods, sauces, and more to cook delicious foods for lunch or dinner. 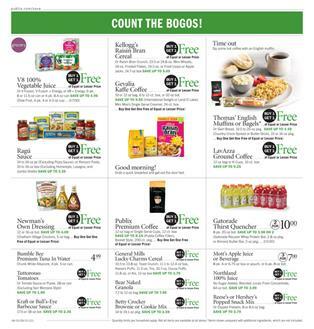 Publix Weekly Ad has this BOGO sale as a classic range of products. Refreshing soda packs are also popular products of the upcoming Spring and Summer days. Publix has the stocks that are on sale right now. 12-pack Pepsi products will be a Buy 2 Get 1 Free sale. Cape Cod kettle cooked potato chips will be a nice treat if you like to consume some snacks while watching your favorite show on TV. A lot of nice TV shows are on their way in April. And also, films like Avengers Endgame will also be of your options this month. 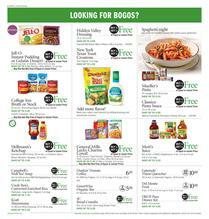 Check out these BOGO Free deals on the latest Publix Ad Preview. 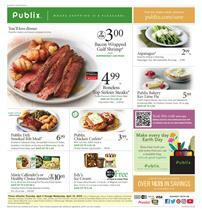 Over $600 savings are available in the latest Publix Ad. Shop for meat, fresh food, grocery items, snacks, seafood, and more for the weekly ad prices. Florida Local fresh produce range of Publix covers a significant amount of fresh products including orange, strawberries, carrots, etc. Tasty foods for your meals will be on sale at Publix Stores. Publix deli smoked rib meal is gonna cost $6.99! Save with the BOGOs of Publix which are classical discounts of weekly shopping at this supermarket. Edy's Ice Cream will be a BOGO Free deal! Save $6.45 off this purchase. Stock up some essentials like coffee or laundry detergent with nice prices by the ad. Earn $10 Publix gift card when you buy $50 participating Stocking spree items. Maxwell House coffee will cost $6.99. Also, learn recipes with the weekly ads. Mission flour tortillas are a BOGO Free deal from the place where you can find salmon fillets, jumbo white shrimp, smoked sausage, and more. Visit pg 9 to see meat and steak. GreenWise Angus NY Strip Steak costs only $10.99/lb. Also, see that the first pages of this Publix Weekly Ad sale have an elegant collection of drinks. The finest of them are gonna be available at the best prices. Follow our Facebook page where you can track the news or subscribe to get emails. View all the best deals of the latest Publix Weekly Ad online sale. Deli, bakery, snacks, soda packs, and more are among the deals. Grab those deals on GreenWise healthy and organic foods on the latest Publix Ad. Milk, ice cream, trail mix, Greek yogurt, honey, and whey protein powder are interesting deals of organic shelf of Publix. Have your breakfast with organic foods of this brand. GreenWise organic brown eggs cost $3.99 only. They are mostly USDA choice products. Browse the items of BOGO Free sale on pg 12-14. Buy your second breakfast cereal for free with this deal. Save $9.55 on 2 purchases of Gevalia Kaffe coffee. Get sports drinks from this range. Gatorade Thirst Quencher will cost $3.98/2. Stock up the refreshing beverage packs like Mott's Apple Juice or beverage which will cost only $7 for 3. Make delicious salads with great dressing sauces. Newman's own dressing is gonna be a BOGO Free sale, too. Visit the Publix store to buy 12-pack Coca-Cola with Buy 2 Get 1 free deal. A lot of savings are waiting for you in this supermarket. You can follow these ads on our Facebook page or you can subscribe to get emails. 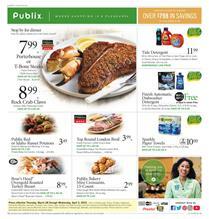 Take a look at the Publix Weekly Ad Grocery sale. Over $798 savings are available in the latest Ad. I should recommend you to see products like Porterhouse or T-Bone steak which are excellent meat offers. Publix Red or Idaho Russet Potatoes is one of the fresh foods. Pay only $3.49 for the potatoes. One of the special sales of Publix is that of household supplies. Clorox bleach, Downy Fabric Softener, Fabuloso Toilet Bowl, and more products are in this category. Make new meals for dinner. Recipe of Marsala chicken is readable on pg 3. If you are eager to shop for delicious foods, one of the best ones is Greenwise savings. La Banderita large flour tortillas are BOGO Free deal! Nathan's Famous Skinless beef Franks is another BOGO Free deal. You can replace some of your food with delicious salads made of the best kind of fresh vegetables. Publix offers salads and fresh veggies on pg 6. Fruits are available on pg 7. Publix pineapple chunks are BOGO Free, too. Shop deli sandwiches, chef salad, Italian whole sub, and more.